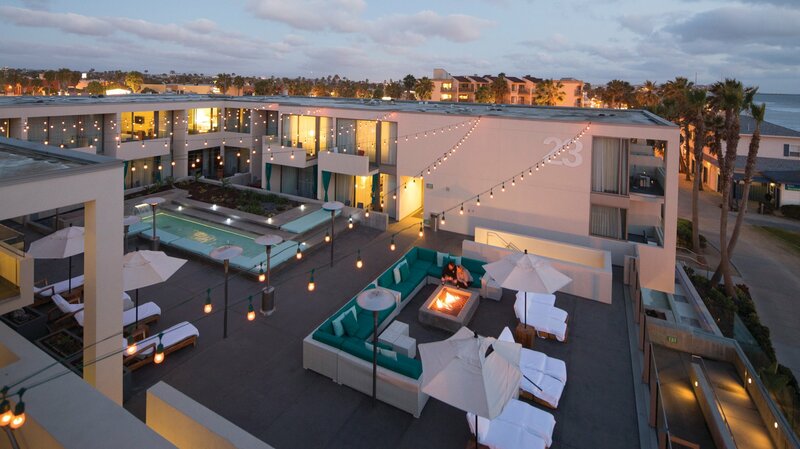 Tower23 is a swanky oceanfront hotel in the Pacific Beach neighborhood of San Diego. With stunning views of the ocean and the iconic Crystal Pier, the hotel gets its name from a nearby lifeguard tower. 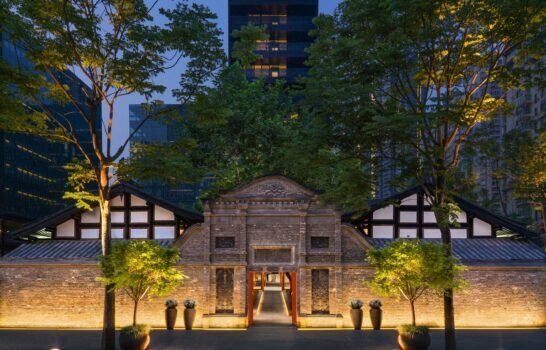 This boutique, luxury lifestyle hotel with 38 rooms and six suites appeals primarily to sophisticated adult travelers, but families are warmly welcomed too. Their in-room spa services, extraordinary hospitality, and modern JRDN restaurant set it apart from other neighborhood hotels. Book through site partners Mr. and Mrs. Smith to receive a welcome glass of sparkling wine. Breakfast vouchers are an additional perk if you're a SilverSmith or GoldSmith member. 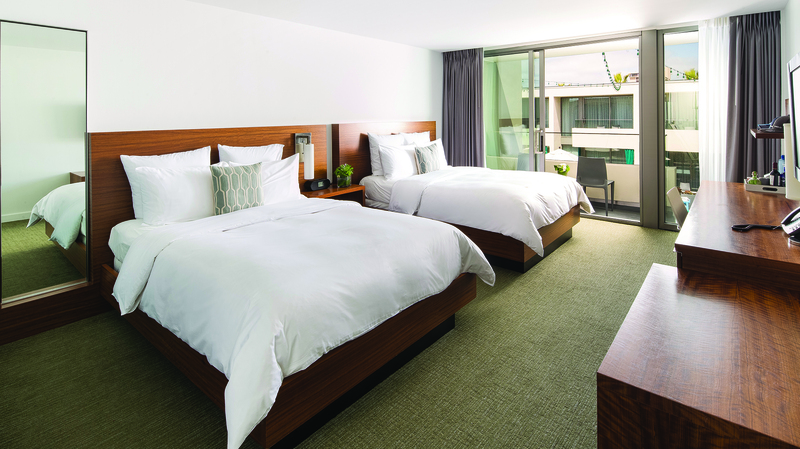 Rooms and suites at Tower23 have a sleek, modern design with a sophisticated minimalist vibe. Tempur-Pedic Serenity beds with Egyptian cotton sheets and down comforters combine with the rhythmic sounds of the ocean to lull you to sleep. A cool blue color palette fused with tropical teak wood, chrome, and glass elements create a tranquil ocean ambience. 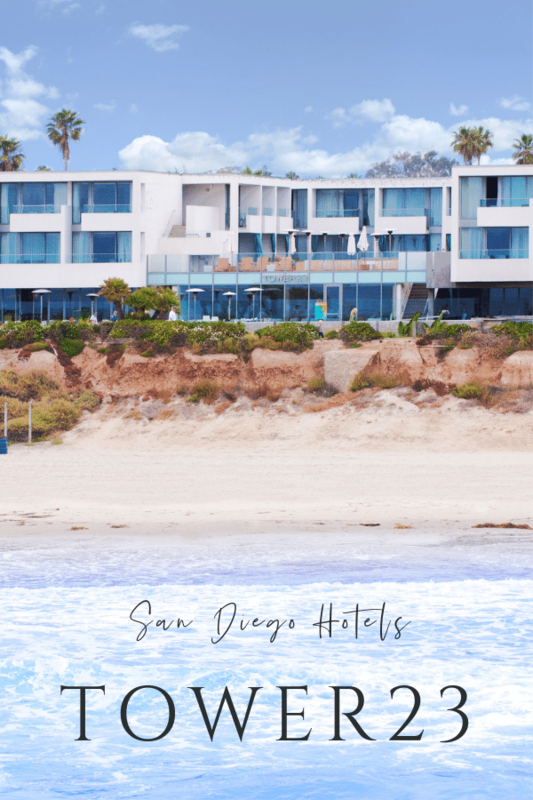 Room amenities include electronic Do Not Disturb signs with fingertip activation, flat-screen TVs with premium channels and on-demand videos, complimentary Wi-Fi, balconies or cabana patios, comfortable work desks, minibars/snack trays, and coffee/tea stations. Hotel23 swag in the form of hats, visors, T-shirts, tank tops, and sunscreen are available for purchase in-room. 24-hour room service is available from a limited JRDN menu. Ensuites have separate tubs and showers, H2O spa products, fluffy towels, and comfortable shower robes. 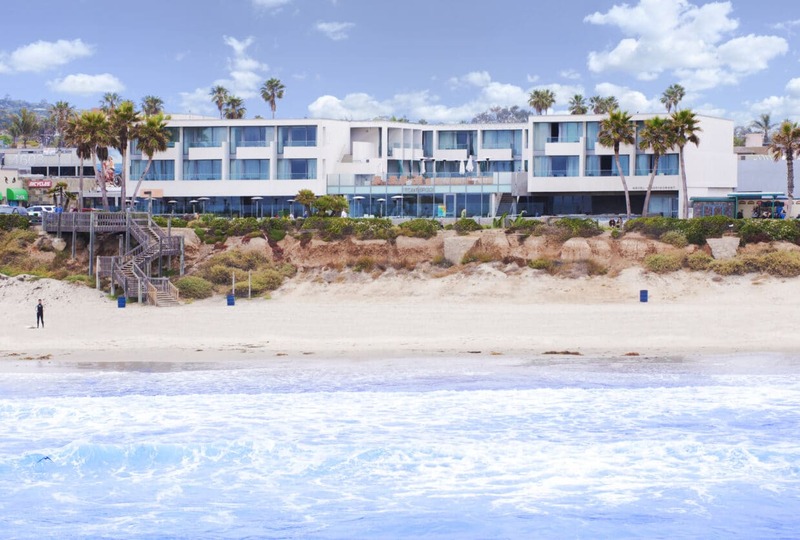 There are four room styles at Tower23 — Sky Pads with partial ocean views, Spirit Pads with Tower Deck views, Serenity Pads with full ocean and Tower Deck views, and Surf Pads with full ocean views. There are two styles of suites at Tower23. Sanctuary Suites are junior suites with partial ocean views. 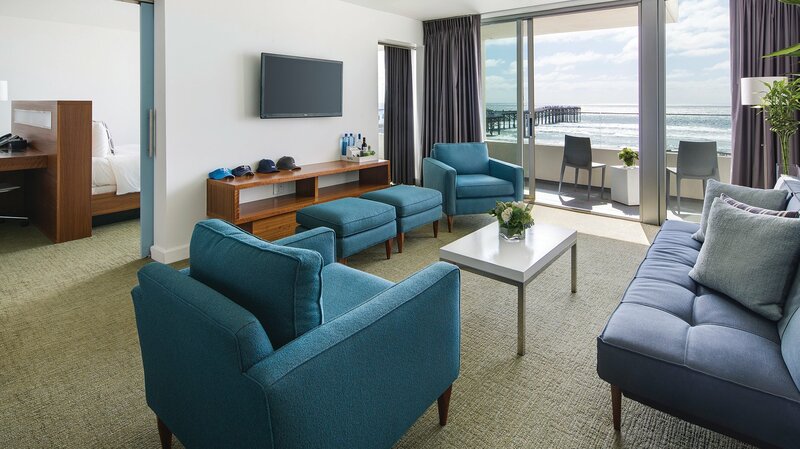 Sweet Suites, the largest accommodations at Tower23, are one-bedroom suites with full ocean views. Sky Pad rooms are located on the hotel’s second and third floors and provide partial ocean views. They come with either a king bed and a comfortable club chair, or two queen beds. They have minimally furnished private balconies or cabana patios. Sky Pad ADA Rooms, also called Queen Queen ADA Rooms, are Sky Pad Rooms with two queen beds, and all the same room features and amenities of Sky Pad rooms, plus enhanced ADA amenities. You can expect roll-in showers with hand-held shower wands, and grab bars in the ensuites, fire alarms with emergency strobe lights, and lowered peepholes. These rooms have partial ocean views and balconies or cabana patios. Spirit Pad Rooms face the Tower Deck and provide views of the deck and Zen water garden feature. They have either a king bed with a comfortable club chair or two queen beds. Second-floor Spirit Pad rooms with cabana patios have the easiest access to the Tower Deck, restaurant, and beach, but may also be the noisiest, especially on busy weekends. Spirit Pad ADA rooms, also called Deluxe King ADA rooms, are Spirit Pad rooms with a king bed, a comfortable club chair, and all the same room features and amenities of Spirit Pad rooms, plus enhanced ADA amenities. You can expect roll-in showers with hand-held shower wands and grab bars in the ensuites, fire alarms with emergency strobe lights, and lowered peepholes. These rooms face the second floor Tower Deck and Zen water garden feature and have either balconies or cabana patios. Serenity Pad Rooms overlook the Tower Deck and provide full ocean views. They have a king bed and a comfortable club chair, or two queen beds. Rooms open onto a private west-facing, ocean view balcony that also provides views of the Tower Deck below with its water feature and dancing fire pit. Balconies are minimally furnished. Surf Pad rooms are the hotel’s in-demand oceanfront rooms that come with either a king bed and comfortable club chair, or two queen beds. These rooms offer the most privacy with minimally furnished, west-facing balconies perfect for morning coffee or sunset cocktails. Third-floor Surf Pad rooms are the quietest room choice at the hotel. 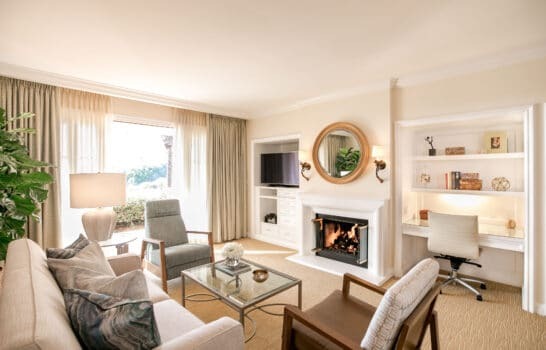 These rooms may also have an option to connect to one-bedroom Sweet Suites. Sanctuary Suites are junior suites with a king bed and seating area that includes a queen sleeper sofa and wet bar. 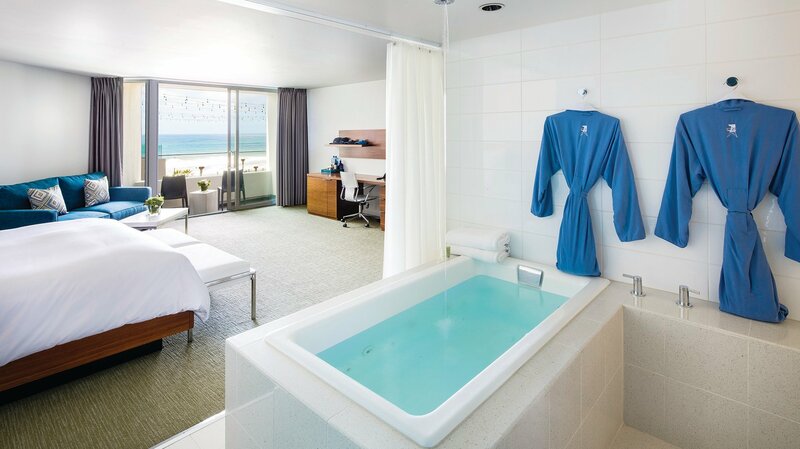 These suites feature floating chromatherapy whirlpool Jacuzzi tubs with an intriguing fixture that appears as though water is falling from the sky. There are separate walk-in rain showers, plus H2O spa products, all of which combine to provide a relaxing in-suite spa experience. Suites overlook the Zen water garden and fire pit on the Tower Deck and offer partial ocean views. The largest accommodations at Tower23 are the oceanfront Sweet Suites with full ocean views. These one-bedroom suites feature a floating king bed in a separate bedroom with a private balcony. Ensuites include floating chromatherapy whirlpool Jacuzzi tubs with separate walk-in rain showers for a tranquil in-room spa experience. Separate living rooms are the perfect place for entertaining with a comfortable seating area, wet bar, 42” TV, and additional private balcony. 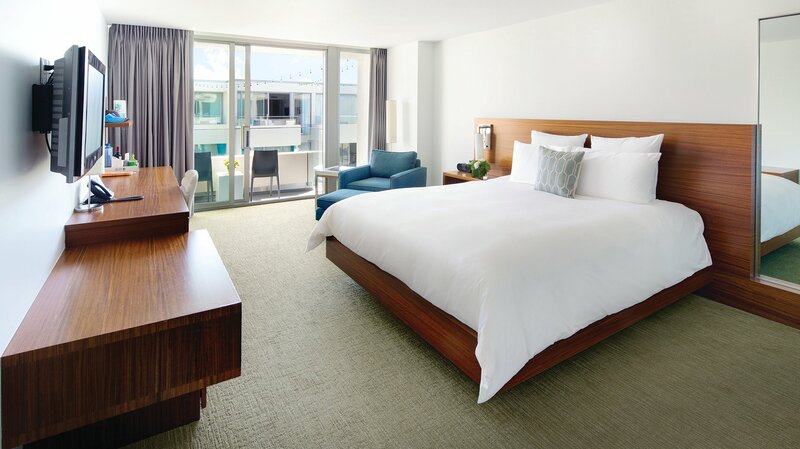 Sweet Suites can transform into two-bedroom suites with an adjoining Surf Pad Room. 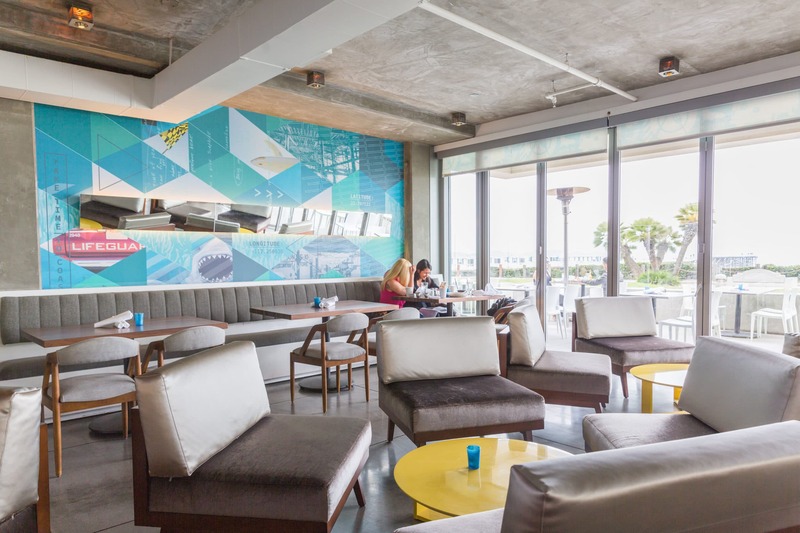 JRDN is Tower23 Hotel’s signature, oceanfront restaurant on Ocean Walk. 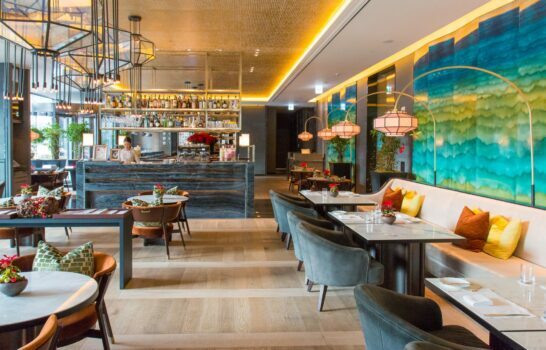 Hotel guests can expect New American cuisine with a modern twist for breakfast, brunch, lunch, and dinner. Menu selections are made from fresh, local, sustainable ingredients including humanely sourced beef and seafood. Patio dining at JRDN is also popular with locals, especially in good weather. This trendy, award-winning restaurant is also a neighborhood favorite, so it’s often busy, especially at dinner. Happy hours offer drink and sushi specials. You shouldn’t expect a plethora of amenities at this boutique hotel, but the small list they offer is mindful of their location and carefully curated to suit. There is no pool, spa, or fitness center, so if that’s a deal-breaker, this is not the hotel for you. 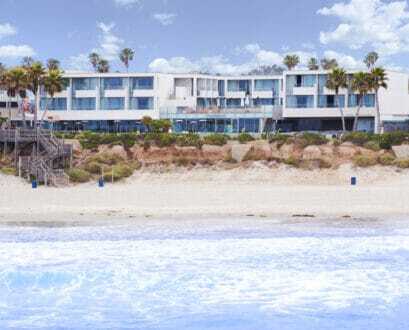 However, there’s an ocean instead of the pool, in-room spa services in place of a spa, and passes for purchase to a local fitness club instead of a fitness center. And of course, the oceanfront location is hard to beat. Tower23’s second floor Tower Deck is for the exclusive use of hotel guests, and their guests. A row of lounge chairs faces the ocean for soaking up the sun, and people-watching on the beach and boardwalk below. Another row of lounge chairs lines one side of the deck facing a long, narrow Zen water feature where guests can also sit with their feet in the water. As the sun sets in the west, the Tower Deck’s ambience turns Southern California cocktail casual, as self-described by the hotel. A comfortable sectional surrounds a large fire pit, perfect for warming chilly San Diego evenings, and providing a cozy space for cocktails and conversation. During summer, Tower23 hosts their sunset Wine Series on the Tower Deck with live music. Although this luxury boutique hotel doesn’t claim to be a resort, it does offer a few valuable, curated resort amenities for a per night resort fee. 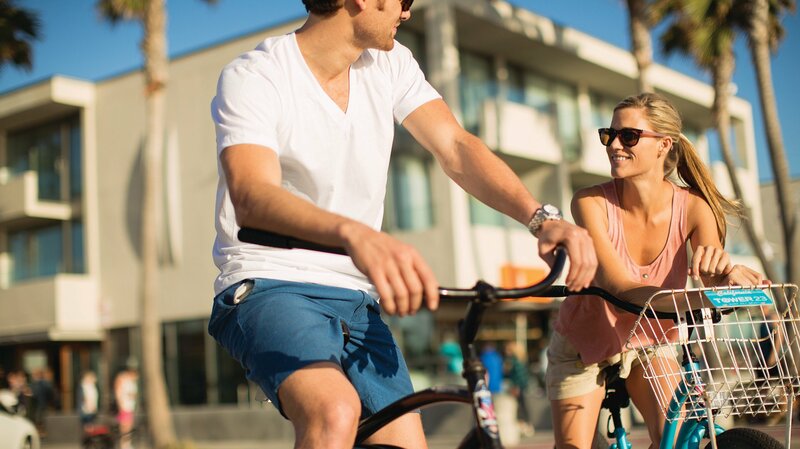 Guests get complimentary daily use of beach bikes and beach gear, and complimentary valet parking. Beach bikes are a fabulous perk since Tower23 is located right on Ocean Walk boardwalk that extends from Law Street just north of the hotel to the jetty on the south end of Mission Beach. This two-mile-long boardwalk, wildly popular with tourists and locals alike, promises to be an entertaining ride. 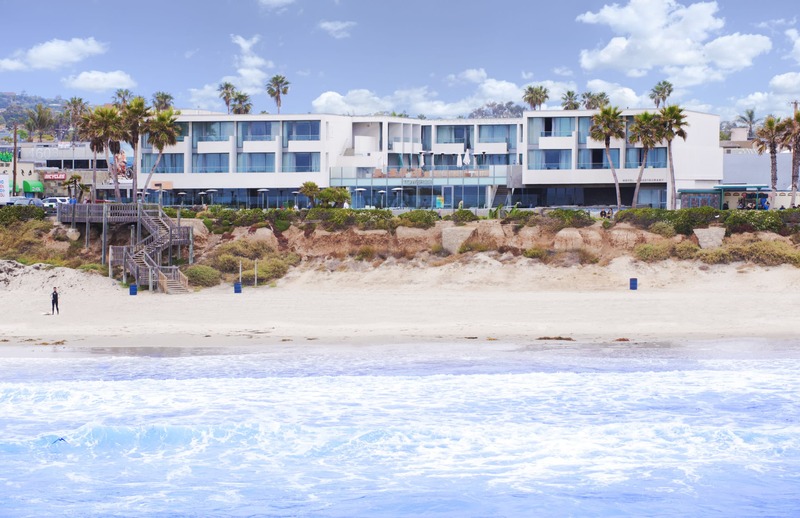 With an oceanfront location, it makes sense that the hotel would provide guests with beach gear for a fun day on the sand. This resort amenity includes beach chairs, umbrella, bag, and beach toys. 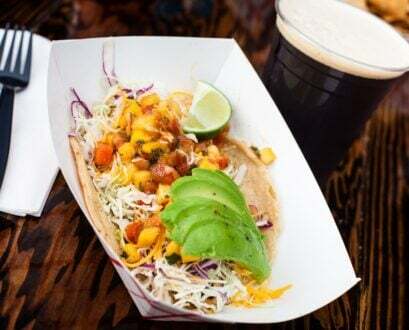 Popular Pacific Beach is one of the most challenging neighborhoods in San Diego to find parking, and where aggressive city towing contractors crawl the streets continuously. 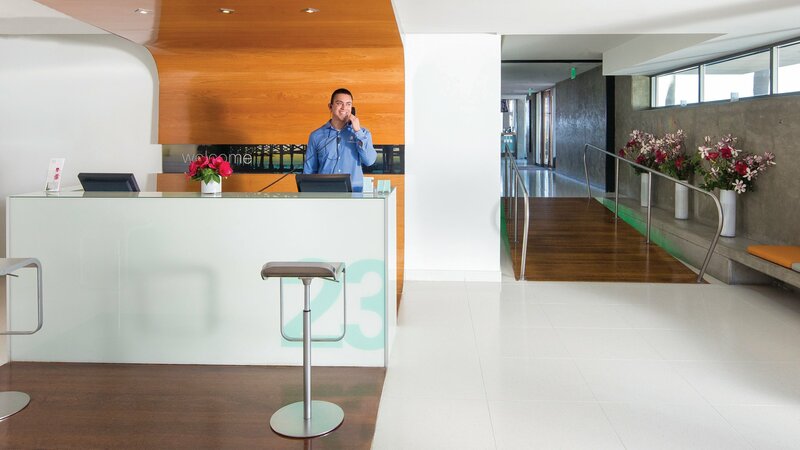 It’s almost unheard of to include complimentary valet parking as a resort amenity, but Tower23 has it. This perk alone is worth the small daily resort fee. Tower23 doesn’t have a designated spa on-site. However, that doesn’t stop them from offering a full menu of spa services to individuals and couples in the privacy of their rooms. Spa professionals provide several therapeutic massages, facials, and body treatments. Spa packages are also available. In-room spa services can be reserved from 8 a.m. to 8 p.m. There is not a fitness center at the hotel. However, hotel guests can purchase day passes to 24-Hour Fitness from the concierge. It’s a one block walk from the hotel. Of course, the oceanfront location provides opportunities for both swimming and surfing. 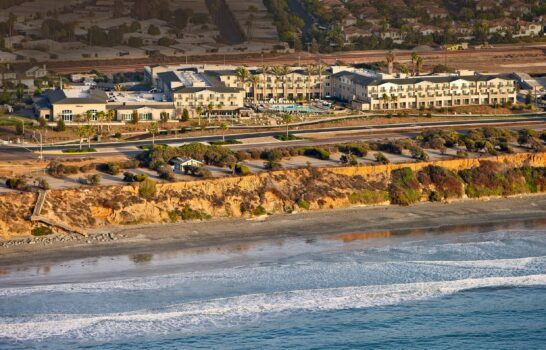 One of the most famous surf spots in San Diego is on the north side of Crystal Pier in front of the hotel. Hotel spa services include options for private yoga sessions and fitness consultations. 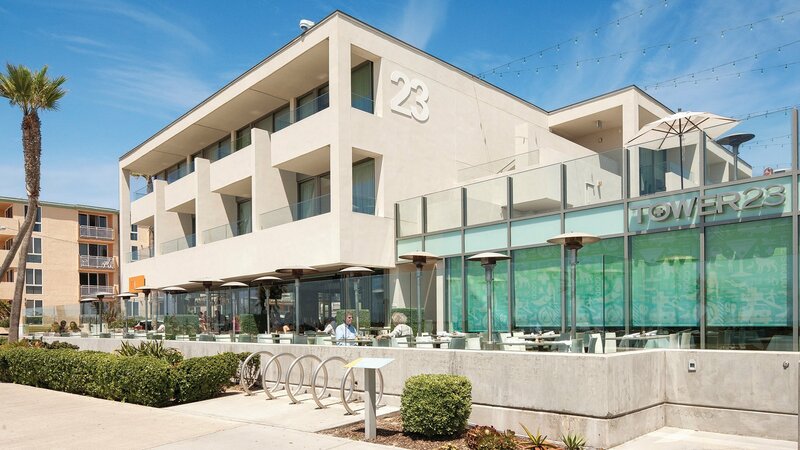 Tower23 Hotel is situated at the north end of Pacific Beach, putting it at the nexus of this popular neighborhood and family-friendly La Jolla. To the south of the hotel, the iconic Crystal Pier is the first noteworthy attraction. There’s a tackle shop conveniently located on the pier so that you can fish from the end of the pier, or during winter you can whale watch there. Crystal Pier is also a great place to watch surfers on its north side. Walking or biking down the long Ocean Walk boardwalk toward Mission Beach, you’ll see plenty of bars, restaurants, and shops. Farther down, you can admire a row of upscale oceanfront homes, before arriving in Mission Beach where you’ll encounter Belmont Park, a historical children’s amusement park. You can continue to the end of Ocean Walk at the jetty. For a different experience, cross Mission Boulevard at Belmont Park to Mission Bay Park and make your way back along the bayside pathway of Sail Bay. This is the water sports hub of San Diego. The path goes nearly all the way around Sail Bay. To get back to the hotel, just cross back over Mission Boulevard at The Catamaran Resort. Both ocean and bay experiences are well worth the effort. Tip: Book through Mr. and Mrs. Smith to receive a welcome glass of sparkling wine. Breakfast vouchers are an additional perk if you’re a SilverSmith or GoldSmith member.